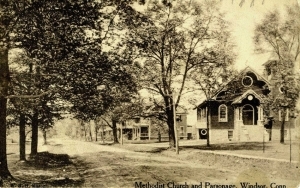 Creators: Mason, William H. H.
Description: Sepia toned postcard view of the Trinity Methodist Church and its parsonage at the intersection of Bloomfield Avenue and Poquonock Avenue in Windsor, CT. This is the second church building erected by the congregation. It was used between 1907 and 1960.